Cycling energy drinks help to replace lost carbohydrate in easily digestible form. When racing, it can be difficult to eat sufficient food, therefore energy drinks can be vital for providing sufficient energy sources and also helping rehydration of lost minerals. The best energy drinks are composed of simple carbohydrates (glucose polymer) and electrolytes to replace lost minerals during intensive exercise. It is important to get the intensity right. Some people can feel sickly if the drink is too concentrated, especially on hot days. I am keen on the High5 Energy Source. I usually buy a 2.2Kg tub and it lasts me for quite a while. It has a good neutral flavour though unfortunately they seem to have discontinued the neutral flavour. A new development in energy drinks is mixing protein in with carbohydrates. 4 parts Carbohydrate – 1 part protein (whey protein). A study by the University of Glasgow suggested the use of 4:1 over a conventional carbohydrate only energy drink during the grueling Trans Alp MTB event, helped competitors finish average 12% quicker than those using the carbohydrate only drink. The theory is that taking on protein causes the body to release insulin. This release of insulin actually results in a higher uptake of carbohydrate by the muscles which need it. 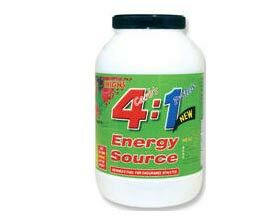 Science in Sport energy drinks are based on malto-dextrin. Malto-dextrin is one of the easiest absorbable carbohydrate sources and can be taken in heavier concentrations. Though, you still want to find a level you are comfortable with. SIS have put a lot of attention into designing plans for best combinations of liquid and food. With the custom SIS bottles it is quite easy to mix and prepare. Tastes fine, not too sweet but is as relatively pleasant as these things can be. Contains electrolytes for rehydration. Suppose you wanted to mix your own energy drink. Mix, cool. Be careful about getting right quantities. Also be careful if you start to add caffeine or other ingredients. This High 5 Bottle bundle - £3.49 from Wiggle includes the following. It is a good value way to get a sample of different energy products. When it is hot, I like to have some isotonic energy gels. The advantages is that you can take them without extra water.